No coredump target has been configured.Host core dumps cannot be saved. I'm seeing the "No coredump target has been configured" message on one of my hosts after installation and it has local storage. I should have fixed this before it has VM's on it but I didn't..
My concern is accidentally initialising an active partition, how can I set the coredump partition and can it be done via the web client? 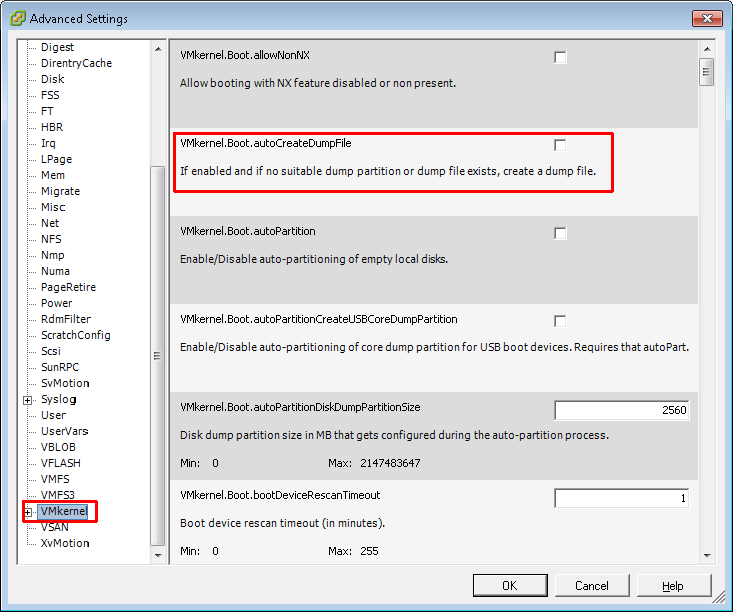 esxcli system coredump partition set --partition="mpx.vmhba2:C0:T0:L0:7"
This will automatically set a partition. Solución al problema "no coredump target has been configured. host core dumps cannot be saved"
Mediante SSH, consultamos el estado de la partición de diagnostico (coredump). El resultado muestra que esto no está funcionando, si es el caso, se necesita re-configurar la partición de diagnóstico. Nuevamente consultamos el estado de la partición de diagnóstico y listo, problema resuelto. Even if I don't understand spanish, I understood the command in Tyepez post and this was the solution for us after migration the boot into a new SAN we had these error on all our esxi host. Thank you for this information. I don't speak Spanish either but this fix worked for me too. Thanks. i am having issue because new ESXi hosts is storing its coredump file on different data stroe on SAN and some ESXi stroing on local disk. i am trying to find out how ESXi pick to SAN (VNX)datastroe or local datastore to store its coredump file. "No coredump target has been configured. Host core dumps cannot be saved". My changes were to remove every local disk on the ESXi host. ESXi installation was made on a SD memory card, therefore there's no room to place core dumps. And this is why ESXi host gives you this warning. Apparently you must have a local disk in which have a partition to reserve for core dumps, but searching on the web i found a solution for my needs. With this solution i can continue to have core dumps (even if i can live without they ;-) ) without having local disks. - vCSA AKA vCenter Server Appliance . If you dont' have vCenter at all or have a vCenter installed on Windows platform i'm sorry, you can stop here, or you can try to adapt some part of this tutorial to match the Windows platform. where vmk0 is you management interface that communicate with vCenter Server Appliance, 192.168.15.8 is the ip of your vCSA and 6500 is the standard remote core dumps collector of your vCSA. Use the vSphere client to do this. 上一篇：vSAN health alarm for vMotion "Basic(unicast) connectivity check (normal ping)"